Our Pawsitively Healthy workshops will resume in January. Until then we hope you’ll find the tips below helpful in keeping your dog or cat safe this holiday season. You can get first notice of new workshop dates by signing up to follow my blog. Just enter your email address in the right-hand column. Dr. Andrea Putt, DVM, of Commerce Village Veterinary Hospital says be sure to keep the following out of pets’ reach. If you suspect that your pet has CONSUMED any of these, immediately contact your veterinarian or veterinary emergency hospital. Your dog will make quite a statement in any of our cool and fun summer fashions. Choose from adorable sun visors complete with sunglasses, polka dot bandanas and girly flowered harness dresses. 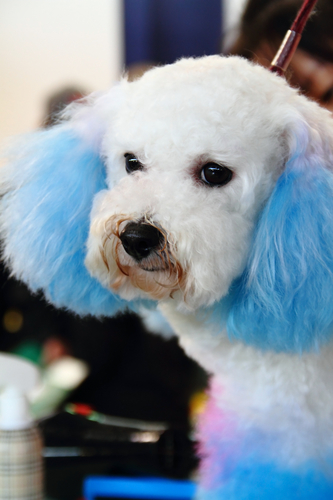 For canines not ready for all this cuteness, see our huge selection of colorful and equally as fashionable harnesses. All styles not available at all stores. 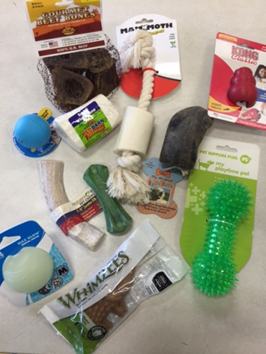 This blog is from your Pet Supplies Plus stores in Bloomfield Hills and White Lake (Highland Rd. and Cooley Lake Rd.). Product selection varies by store. Not all stores have all items. Call store to check availability. Hockey and football fans– see our selection of hockey jerseys and pro and college football jerseys and leashes. Go Wings! Go Lions! Go Blue – and Go Green Go White! Here’s a great way to help your dog stay cool this summer while having loads of fun. This giant ice cube, that you make yourself, is packed with treats and toys that you chose for your dog. The fun keeps going even after the ice melts! A heavy-duty p lastic container. Small buckets, large dog food or water bowl, a children’s pail or plastic storage containers work fine. Choose the size based on the size of your pet. For smaller dogs, choose a smaller size container and so on. *All are available from Pet Supplies Plus. *Available from Pet Supplies Plus. If you your dog likes vegetables like carrots include these too. Water or chicken stock (makes a tastier treat!). Place the above toys, treats and veggies (if using) into the plastic bucket or container. Fill with water or chicken stock. Fill to about one inch from the top. Put the container in the freezer and freeze overnight or until solid. 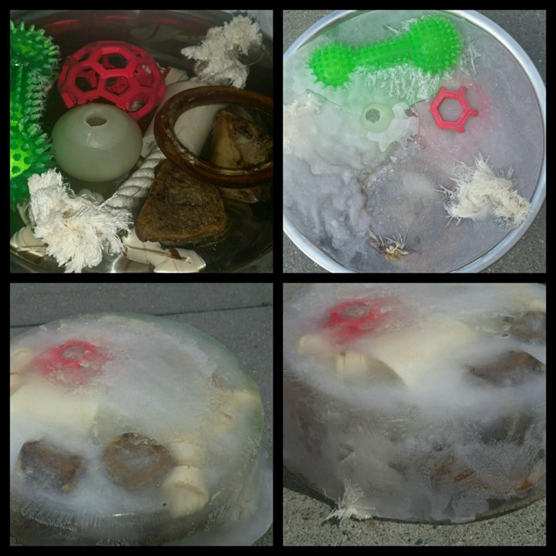 Pop the ice block out of the container and let the fun begin! TIP: You may want to make several of these at once so that you are always ready for summertime doggie fun!